I’m someone who loves working on and completing a project, for me it is about feeling the sense of achievement and seeing the results, that spurs me on to get to the finish point. During the summer months I spent most of my spare time making handmade items for our wedding day. The feelings associated with the starting phase of a project, seeing it take shape, then completing it, and using it as part of our day, gave me the drive and desire to continue making things that have a purpose and meaning. At this time of year as the weather is turning colder and the days are shorter, I am drawn towards snuggling on the sofa under a blanket and picking up a comforting project, this tends to involve crochet or knitting. A few weeks ago I decided it was time to pick up my crochet hook again. With my urge to crochet a few weeks ago, I got the project out of the basket and looked at it. The row of crochet in the red wool still didn't work with the look of the blanket that I wanted to create. I wondered whether if unravelling the rows of crochet including the red row, and starting again from that point, would mean that I would enjoy moving forwards with the project again. I sat with the blanket on my lap and realised that perhaps the size of the blanket would not quite fit what I wanted from it now. I decided that rather than unravelling the rows, I would keep what I had made, use it as a basis of learning, and start a new blanket instead. Letting go of all the hard work and the time I put into creating what I had made was an uncomfortable thing to do. 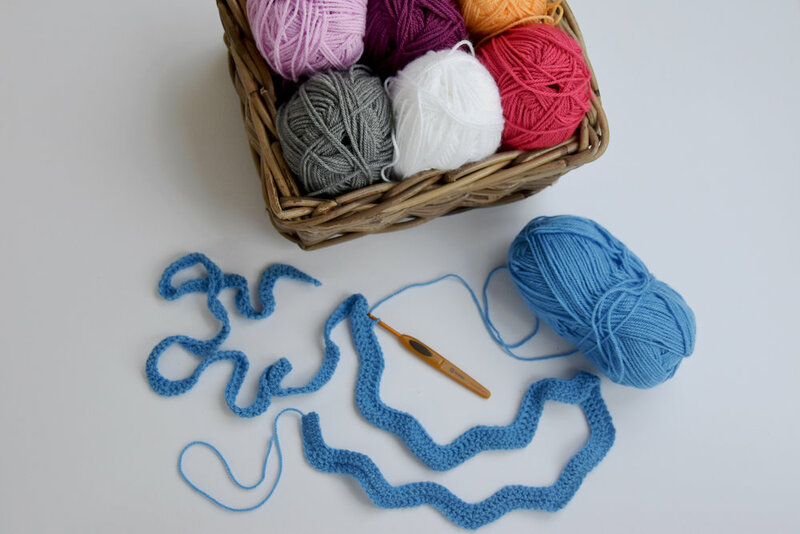 I decided that I wanted to move forwards, rather than unravel it, and instead decided to reshape the size and feel of the blanket into something that I would love...and so it began, it was time to make a fresh start and make a new foundation chain. I started again with a favourite colour, sky blue, and set about creating the foundation chain. It took a few attempts to get the foundation chain looking, sitting and feeling right. The foundation chain was made purposefully longer this time so that I could create a bigger and more useful blanket. Working the the first row of crochet stitches into the foundation chain was harder than I had remembered it being the first time round. It took time, patience and determination to make each stitch. There were moments when I thought about giving up but I wanted to persevere as I felt that this blanket, in this pattern, would be something special to create. Whilst I was creating the stitches one by one, it crossed my mind that there may be other things that this analogy of making a new foundation chain and new blanket could fit with. Letting go of something you have started and have put time into, whatever it may be, such as a handmade project, a half read book, a course, a career, a relationship, or a plan…and making the decision to leave it where it is and to not continue with it is really ok. Taking the time to let the decision sit with you, to think it through, and feel assured that it is time to let it go, enables a movement forwards with something new, and allows the creation of choice and freedom to be felt. I smile as I write this as I have experienced myself letting go of some of these examples, some are more recent than others, some have been easy to let go of, and others not so. Is there anything you have started that you feel is time to let go of, or anything you have started and want to reinvigorate? As we head into winter perhaps take a moment to take those thoughts with you, let them hibernate within you during the season ahead, so that you can begin to make decisions to move towards something new and gradually create your own new foundation chain.